30 Days to permanent weight loss, one portion at a time. Author Lisa Young, PhD shows you how to permanently lose weight by right-sizing your portions without eliminating entire food groups or staring at an empty plate. 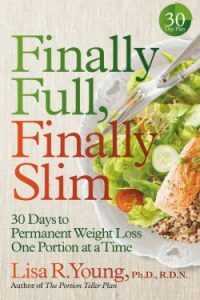 Within these pages, Dr. Young outlines thirty days’ worth of simple changes to help you shed pounds and provides a portion plan that ensures you will feel satisfied. She expertly describes the relevance of diet to health and steers you toward whole foods and away from clever marketing claims that may be secretly sabotaging your weight-loss efforts. You’ll learn useful strategies for how to eat out, enjoy special occasions, and indulge in a favorite treat without tipping the scale.